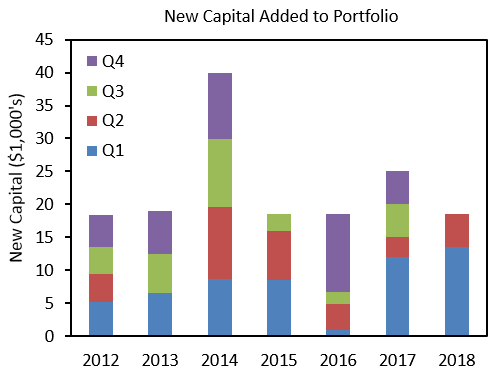 Discussion of portfolio changes in the second quarter of 2018. The purpose of this article is to review my investing progress in the second quarter of 2018. I follow a value-oriented dividend growth investing strategy that involves buying attractively valued stocks of companies that consistently pay and grow their dividends. My long-term investing goals are to: (1) build a sustainable and rising dividend income stream that beats inflation; and (2) preserve and grow my capital by attaining a satisfactory total return on my investments. In this article, I will provide an update on my progress toward achieving these goals since my previous review. As always, I will be presenting real results from a real portfolio involving real money. I contributed $5,000 in new capital during Q2, increasing my year-to-date total to $18,500 and keeping me on track to reach my goal of $25,000 by the end of the year. As usual, my contributions tapered off into the summer, but they will start to rise again near the end of Q3. Going forward, my ability to invest new capital will be helped by a 2.5% pay raise from my employer that will take effect in August. Dividend growth stocks represent the parts of my dividend growth machine. The table below shows the composition of my portfolio at the start and end of Q2 2018, with changes highlighted. I started a position in Altria (NYSE:MO), a tobacco company that does business in the United States. The stock had been on my watch list for a long time, but its valuation did not become attractive until the stock price went below $60 in April. Altria is a well-run company in a market that is facing a systemic decline in product volume and ever-present regulatory issues. However, as the dominant player in the U.S. market, it has strong brands and good pricing power. It also benefits from an equity investment in alcohol giant Anheuser-Busch InBev (NYSE:BUD). The stock is a Dividend Champion with a 49-year dividend growth streak that will likely continue for many more years. I think it nicely complements my long-time position in Philip Morris International (NYSE:PM), which was spun off in 2008. I started my position in MO with 30 shares at $56.56, and the stock remains a candidate for new money. I also started a position in Starbucks (NASDAQ:SBUX), a well-known global chain of over 28,000 stores selling coffee and related products. It was another stock that I had watched for a long time, but which always seemed to be richly valued. A recent slowdown in growth, coupled with management changes, led to a steep selloff of the stock in June. Even though its U.S. market might be saturated, I think the company has good opportunities for overseas growth, especially in China. The stock is a Dividend Challenger with a 9-year dividend growth streak, accentuated by last month’s 20% dividend increase. I started my position in SBUX with 35 shares at $53.60, when I deemed the stock to be fairly valued. It appears I was a bit early with my purchase, as the stock price continued to fall to around $48, but that simply makes it more attractive for additional investment. Now that I am a shareholder, I am happy to often see a long line of students at the main Starbucks location on the university campus where I work. I added to my position in toy and game maker Hasbro (NASDAQ:HAS). The Toys ‘R’ Us bankruptcy has weighed on Hasbro stock price, but I doubt there will be any long-term effects, given that other retailers can easily fill the gap in sales. The recent acquisition of Power Rangers and other assets from Saban Properties shows that Hasbro continues to strengthen its collection of brands. I bought 20 shares of HAS at $83.96, resulting in a total position of 50 shares. I increased my position in drug company AbbVie (NYSE:ABBV), which is known primarily for its blockbuster Humira that treats rheumatoid arthritis, psoriasis, Crohn’s disease, and other conditions. I started my position in the stock back in 2011, before AbbVie was spun off from Abbott Laboratories (NYSE:ABT). Seven years later, I decided it would be worthwhile to buy more shares, especially with the stock trading at a good valuation. I bought 15 shares of ABBV at $88.96, resulting in a total position of 60 shares. Also in the healthcare space, I made a small increase to my position in biotech company Amgen (NASDAQ:AMGN). I continue to like the firm’s stable cash generation and dividend growth. I bought 5 shares of AMGN at $166.79, resulting in a total position of 90 shares. 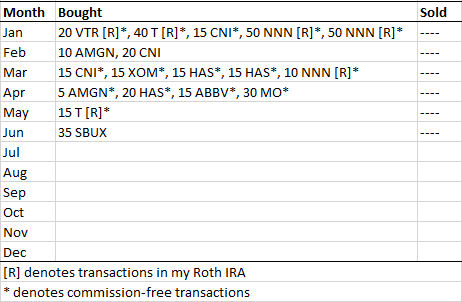 The only purchase I made for my Roth IRA in Q2 involved selective dividend reinvestment to increase my position in telecommunications giant AT&T (NYSE:T). The company recently completed its acquisition of Time Warner, and even though the deal adds a lot of debt to the balance sheet, I think it was a good move by management. I bought 15 shares of T at $31.70, resulting in a total position of 215 shares. In summary, I made six purchases and zero sales during Q2, keeping with my desire to have low portfolio turnover. Transaction fees (year to date) have averaged just 0.06% of my total costs, thanks in part to commission-free transactions earlier in the year. I will likely be paying commissions for most of my transactions going forward, but I negotiated a lower-than-normal commission fee when my accounts transitioned from Scottrade to TD Ameritrade, so that will help keep costs low. 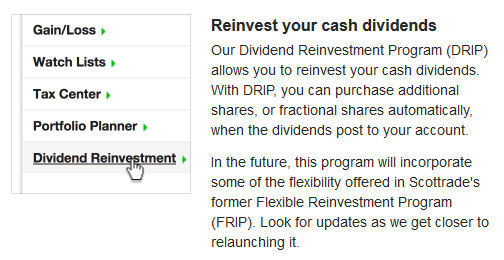 Last month, I received an e-mail (see excerpt below) from TD Ameritrade hinting at a more flexible dividend reinvestment program in the future. I was a fan of Scottrade’s FRIP, especially for my Roth IRA, so I would welcome a similar program again. Besides adding or removing parts from my machine, I want to make sure all the parts are running smoothly. I monitor the operating results of my companies and stay on the lookout for dividend increases (or decreases). Thus far in 2018, there have been dividend increases for 32 of the 44 stocks in my portfolio. The mean and median increases have been 11.1% and 8.7%, respectively. As expected, General Mills (NYSE:GIS) did not announce a dividend increase in June, consistent with foreshadowing from management about focusing on debt reduction associated with its Blue Buffalo acquisition. 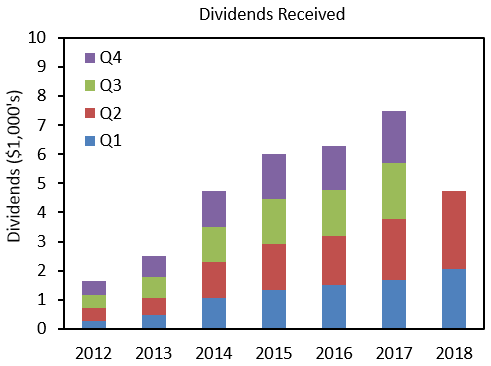 I received $2,646 in dividends in Q2 2018, a 26.6% increase over the $2,090 that I received in Q2 2017. The increase reflects a combination of organic dividend growth, selective dividend reinvestment, and new capital investment. At the end of Q2 2018, my forward 12-month dividend total was $9,619, so I am now averaging just over $800 in dividends per month. My portfolio finished Q2 at $366,334. Most of the gain over Q1 came from organic growth and dividends. For a comprehensive view, I will also summarize the investments outside of my dividend growth machine. I participate in retirement plans with my employer, for which I have allocated 100% of all contributions to the Vanguard Institutional Index Fund (MUTF:VINIX), which tracks the S&P 500 index and has an expense ratio of 0.04%. The combined value of the plans was $82,242 at the end of Q2. I also have a Health Savings Account to which I contribute each year, and it ended the quarter with a value of $15,232. As noted earlier, new capital contributions will not rebound until near the end of Q3. Consequently, no purchases are planned for July, and buying activity will be limited in August and September. No sales are planned. A boring outlook, perhaps, but not unusual for a buy-and-hold dividend growth investor. I will end this article by expressing some thoughts about David Fish, a pillar of the dividend growth investing community who passed away in May. David created and maintained the Dividend Champions, Contenders, and Challengers list, an immensely informative and widely used resource among dividend growth investors. I still have saved copies of the list from 2011, which is when I started to educate myself about investing. 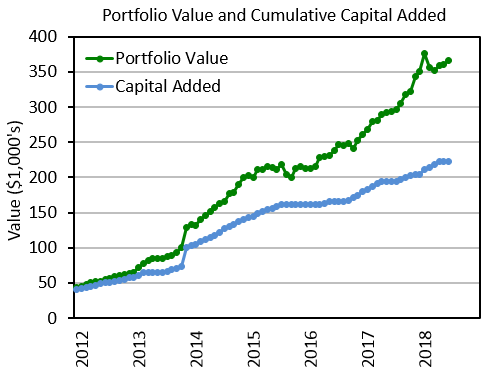 Thanks to the work of David and others, it did not take long for me to realize that dividend growth investing was a sensible strategy to follow. The Dividend CCC list helped me implement the strategy, and I continue to use recent versions of it to inform my investing. Beyond maintaining the list, David would regularly post articles here on Seeking Alpha to aid investors in monitoring their portfolios. I always looked forward to his articles about expected dividend increases. I will miss him, for he was truly the MVP of dividend growth investing. Thank you, David. 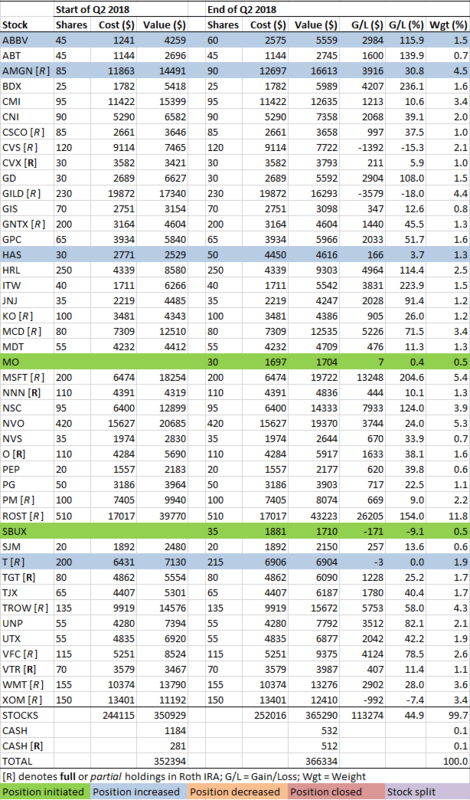 Disclosure: I am/we are long ALL STOCKS LISTED IN PORTFOLIO TABLE. I wrote this article myself, and it expresses my own opinions. I am not receiving compensation for it (other than from Seeking Alpha). I have no business relationship with any company whose stock is mentioned in this article.